We are often asked if our fluorescence adapter system will work with a particular stereo microscope. The beauty of the approach is that it is nearly universal. The only piece that touches your microscope is our Adapter Ring, which attaches at the base of the objectives where a ring light would attach. 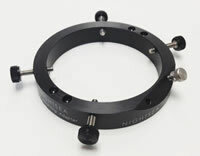 The inside diameter of the Adapter Ring is 67mm and with the thumbscrews it can work with any diameter down to 50mm. 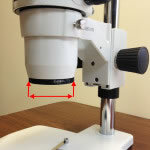 If you have an old or oddball microscope that is too large or a different shape it may be possible to find intermediate adapters. Adapter Ring – Inside diameter 67mm. Red arrows indicate where the Adapter Ring attaches. Below is a partial list of stereo microscopes that we know the system has been used with. If you have any additions please let us know so we can add it to the list to make it easier for others.